A new model from the collection of Cartier Crash. 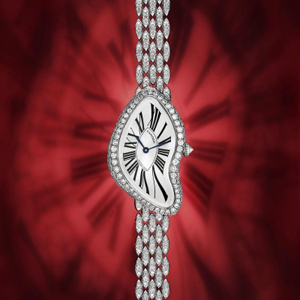 In 2013, a collection of Crash popular brand Cartier will be supplemented by new in the case with irregular outlines. White dial features black Roman numerals and two arrows to display hours and minutes. Housing is attached to the bracelet, inlaid 471 diamonds weighing 4.27 carats. New products will be collected on the basis of the manufacturing machinery with manual winding Cartier.